November 11, 2005. Several young alumni returned to campus today to meet with prospective students and their families. The concept was to provide these young men, all top students, with an idea of the benefits of a Wabash education. 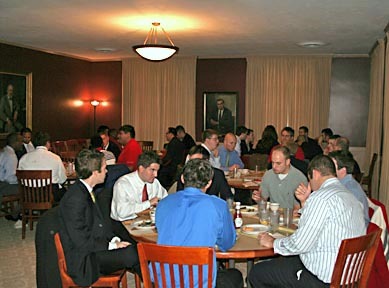 Before the recruiting day kicked off, several of the same alumni gathered for breakfast in the Sparks Center with current Wabash students. This informal get-together, put together by Scott Crawford and Stephanie Hopkins in the Schroeder Center for Career Development, gave our current students yet another perspective on life after Wabash. While 7:30 AM is pretty early for students, especially on Monon Bell game weekend, the turnout was great.